Written in response to the demand from clients and astrology students, this book provides an introduction to the financial universe, illustrating the role of the Sun, Moon, planets, and major planet cycles in market movements. 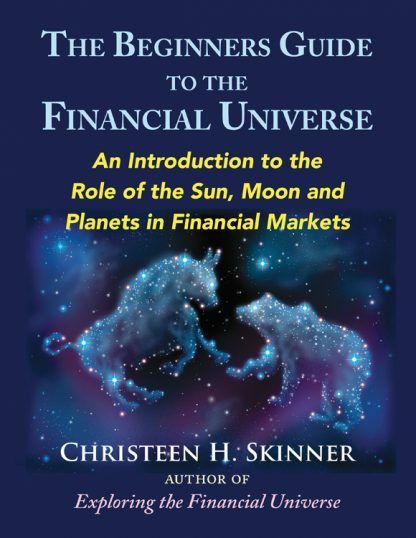 In The Beginners Guide to the Financial Universe, financial astrologer Christeen Skinner takes a step-by-step approach to understanding how the events in the solar system affect market movements. Starting with the sunspot cycle and moving on to seasonality charts and lunar trading, she presents information in an easy-to-read style. As viewed from Earth, the planets each have periods when they appear to be retrograde, i.e., moving backward relative to Earth. These periods and their correlation with market activity are considered along with the role Mars plays as it moves through each sign of the zodiac. The phases of a recognized 20-year business cycle�the exact period between one conjunction of Jupiter and Saturn and the next�are also explored. The concluding chapter offers date, time, and place data that can be used for further investigation.